We had these delicious garlicky green beans for dinner tonight, with beef and broccoli and brown rice. DELICIOUS! My sister and I both love these green beans. Make sure they are still a bit crunchy, and don’t overcook them! Crunchy, garlicky green beans! These are awesome with a little bit of brown rice. In a large pot, bring water to a boil. Add the beans and let them turn bright green, about 2 or 3 minutes, then immediately dump them into ice water to stop them from cooking further. Before starting, make sure you have prepared all of your ingredients and have them on hand next to your stove. Heat a wok on high heat, and add the grapeseed oil. Add shallots, garlic, and ginger, and cook for a minute, stirring constantly so it does not burn. Add the green beans, and cook for a few minutes, making sure every bean is coated by the oil mixture. Make sure you don't overcook the green beans! Add the soy sauce, and cook a few minutes more. 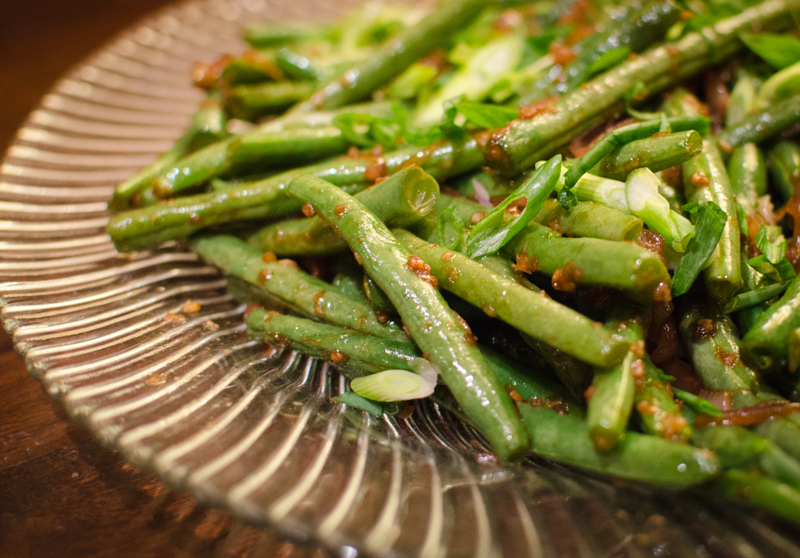 Plate the green beans on a platter, and scatter with sliced green onions.